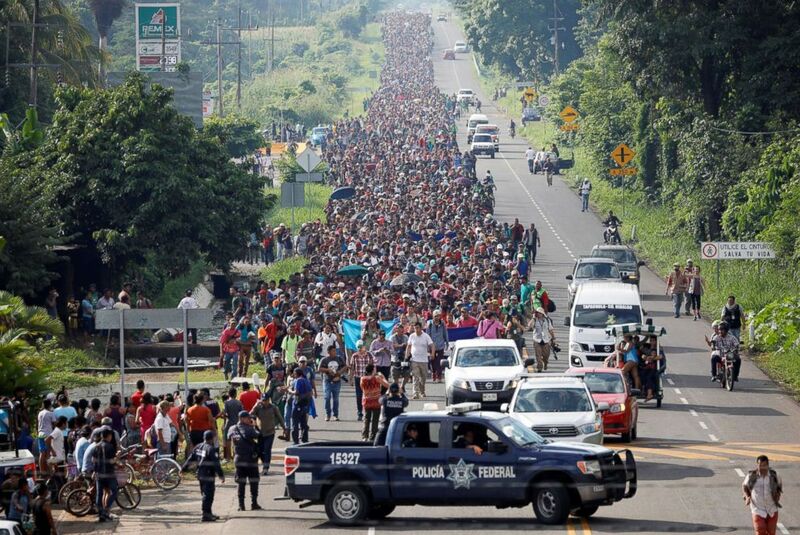 A caravan of thousands of footsore Central American migrants who say they are seeking refuge from violence in their countries was moving north Sunday under the close watch of an army of Mexican federal police in riot gear. Mexican officials said federal police were staying in front of the caravan, which stretched about two miles and comprised of mostly people from Honduras and Guatemala, many of whom say they are determined to reach the U.S. border 1,700 miles away. Those Mexican officers, transported in a convoy of tour buses and joined by riot police from across the country, have announced they will not let the migrants pass a small town near the border. "Full efforts are being made to stop the onslaught of illegal aliens from crossing our Southern Border," President Donald Trump tweeted Sunday afternoon. People have to apply for asylum in Mexico first, and if they fail to do that, the U.S. will turn them away. The courts are asking the U.S. to do things that are not doable!" One woman in the caravan, Blanca, held tight to the arms of her two young sons as her teenage daughter walked beside them holding water bottles. Blanca told ABC News that she fled Honduras with her children after her husband was killed by gangs. She said she would accept asylum in Mexico if officials there offered it to her, but her goal was to make it all the way to the U.S. border. "My family is suffering right now, but what's happening in Honduras is worse," Blanca said. The phalanx of police, supported by Mexican military Blackhawk helicopters overhead, was bracing for a repeat of the violent clashes that occurred on Friday when the caravan stormed and overran a crossing at the Suchiate River at the border of Guatemala and Mexico. 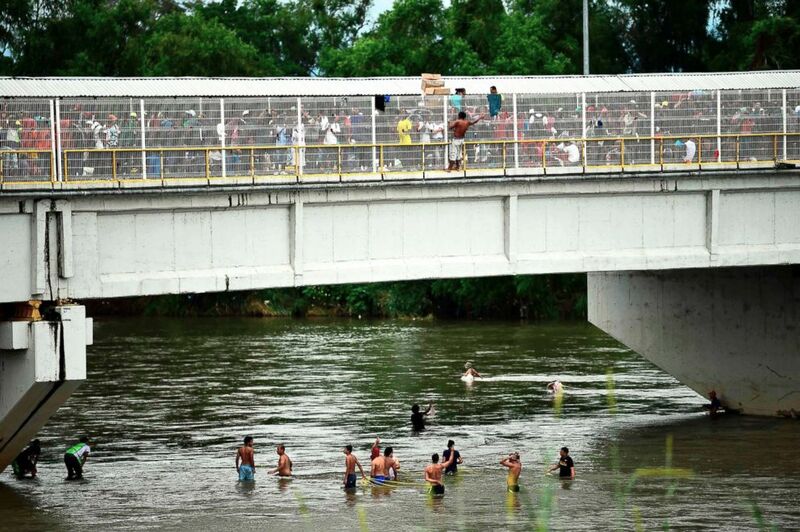 Members of the caravan crossed into Mexico illegally by either forcing their way through a border fence or jumping into the river and swimming to the Mexico side. (Ueslei Marcelino/Reuters) Central American migrants walk along the highway near the border with Guatemala, as they continue their journey trying to reach the U.S., in Tapachula, Mexico Oct. 21, 2018. "Donald Trump, we don't want to cause you any problem, we just want to get a job. Help us," one young migrant told ABC News as he and hundreds of others walked along a road near Tapachula, Mexico. 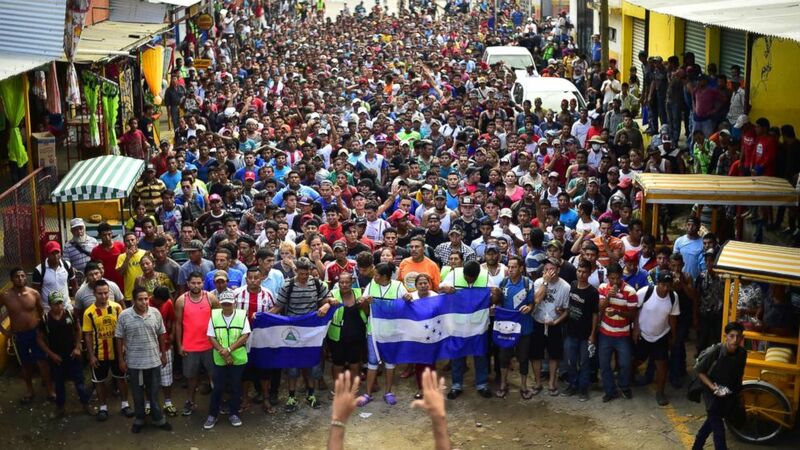 Many in the caravan demonstrated that they still had pride in the respective countries they were fleeing by holding the flags of Honduras and Guatemala as they walked. 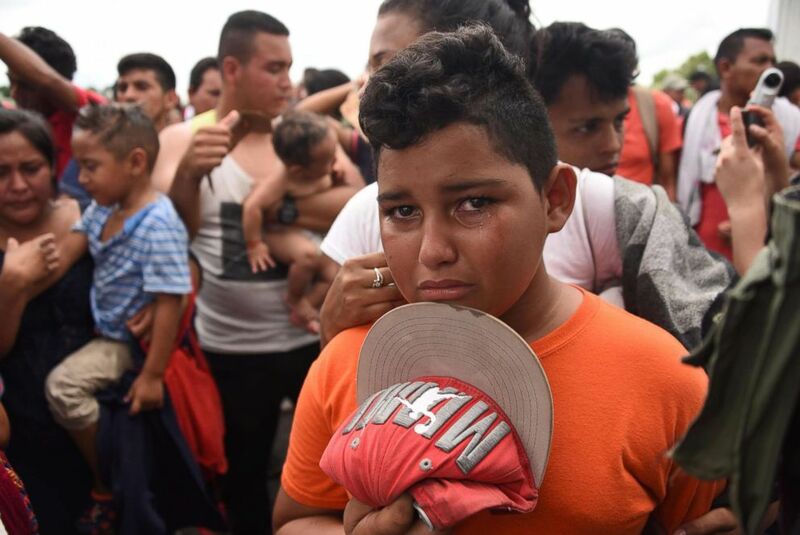 One of the faces of the so-called migrant caravan. Moments after this was shot she tried to stand up and collapsed. I caught her in my arms. We whisked her away to a hospital nearby. There are thousands marching towards the town of Tapachula. These people have a little water almost no food and it’s over 87 degrees. Locals in the villages have been handing out water and rice and beans. The generosity is incredible. And those on the march helping each other out - strangers holding other people‘s babies and carrying them for miles. As incredible as the suffering seems to be here, every single one of the people I’ve spoken to, says what’s behind them in Honduras is far worse. Among the thousands of migrants are families; fathers and mothers carrying sweating children on their shoulders, shielding them from the ferocious sun. ABC News saw at least one toddler splayed out on the highway sleeping, his father too tired to go on. Most people were carrying small backpacks and plastic bags. They walked on battered shoes, some were barefoot. As the migrants walked through villages, local residents came out of their houses to offer food and water. Occasionally, passing motorists would offer rides to the tired migrants, as many had been walking since 4 a.m Sunday. "God will help us," one exhausted 20-year-old Honduran mother carrying her toddler son told ABC News as the temperature rose to 87 degrees by midday. In a series of tweets last week, President Trump threatened to “call up the U.S. military and close our SOUTHERN BORDER” if Mexico doesn’t do anything to stop the flow of migrants. In late April and early May, a much smaller migrant caravan made it all the way to the U.S.-Mexico border, but only a handful of the asylum seekers were processed by U.S. Customs and Border Protection. Trump was critical of the caravan and in a series of tweets slammed "Democrat-inspired laws on sanctuary cities" for encouraging such a journey. "Are you watching that mess that's going on right now with the caravan coming up? Are you watching this and our laws are so weak, they're, so pathetic?" Trump said at a rally on April 28 in Michigan. Trump continued on Sunday to blame Democrats. 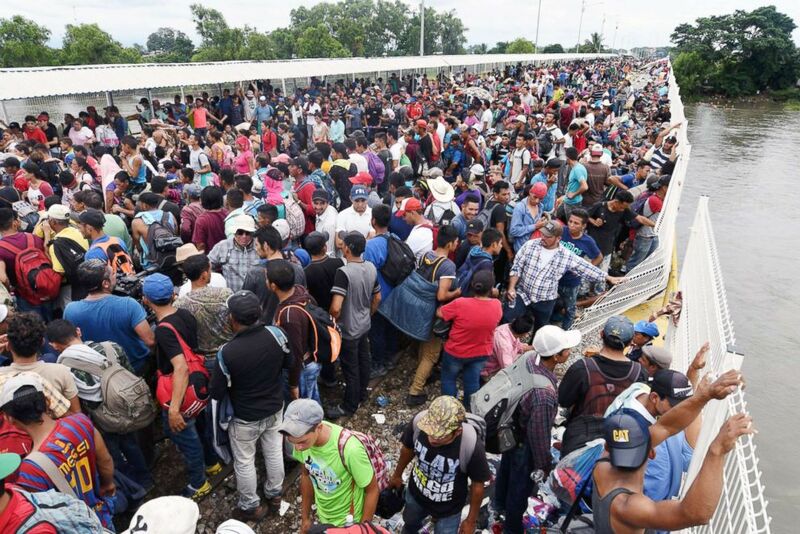 "The Caravans are a disgrace to the Democrat Party," the president tweeted on Sunday. "Change the immigration laws NOW!" Secretary of Homeland Security Kirstjen Nielsen said in a statement Sunday morning that she and other U.S. officials are monitoring the caravan's progress and are concerned about criminals infiltrating the group. (Johan Ordonez/AFP/Getty Images) A Honduran migrant boy taking part in a caravan heading to the U.S., cries as he waits on the Guatemala-Mexico border bridge, in Ciudad Tecun Uman, Guatemala, on Oct. 20, 2018. “While we closely monitor the caravan crisis, we must remain mindful of the transnational criminal organizations and other criminals that prey on the vulnerabilities of those undertaking the irregular migration journey," Nielsen said in her statement. "We shall work with our partners in the region to investigate and prosecute to the fullest extent of the law all who seek to encourage and profit from irregular migration," Nielsen said. "We fully support the efforts of Guatemala, Honduras and Mexico, as they seek to address this critical situation and ensure a safer and more secure region." 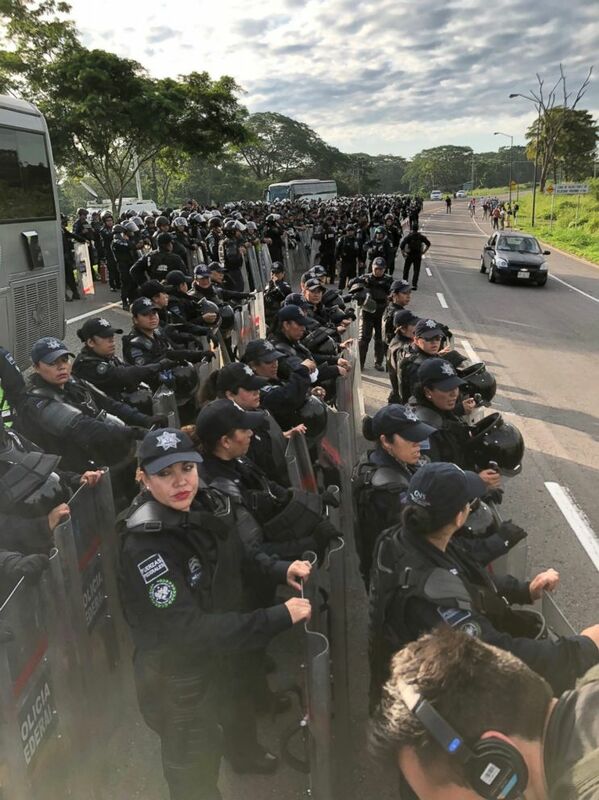 (Matt Gutman/ABC News) Riot police prepare in Mexico as a caravan of migrants heads toward the U.S. border, Oct. 21, 2018. 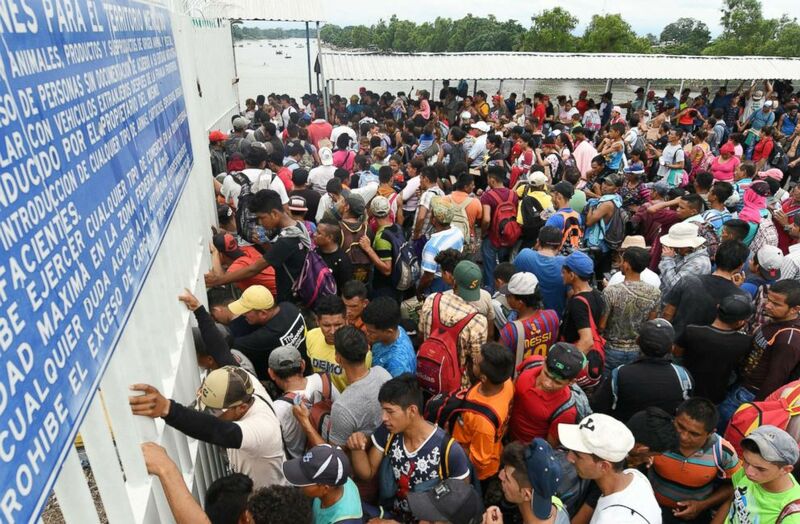 Most of the migrants ABC News spoke to said they wanted to march all the way to the U.S.
Mexico said it's willing to open its doors, temporarily. Mexican police officials used bullhorns Sunday to warn the migrants they were illegally proceeding north. The migrants were advised to apply for asylum in order to get temporary status to legally stay in Mexico. (Pedro Pardo/AFP/Getty Images) Honduran migrants heading in a caravan to the U.S., hold a demonstration demanding authorities to allow the rest of the group to cross, in Ciudad Hidalgo, Chiapas, Mexico after crossing from Guatemala, on Oct. 20, 2018. "You cannot go all around the country like this," officials on bullhorns shouted. "You can go to immigration camps or shelters, so we can establish your cases." Mexican asylum status grants migrants a 45-day stay in the country. (Orlando Sierra/AFP/Getty Images) Honduran migrants taking part in a caravan to the U.S. wait to cross to Mexico, in Ciudad Tecun Uman, Guatemala, on Oct.20, 2018. Many in the caravan told ABC News that they feared being deported if they voluntarily went to a shelter or immigration camp. Some were demanding proof that they will not be returned home. Some migrants like Gonzalo Martinez, a farmer from Guatemala, heeded warnings from authorities and decided to return home after witnessing Friday's clashes at the Guatemalan border. Mexican police unleashed pepper spray on the caravan but failed to turn the migrants back. (Orlando Sierra/AFP/Getty Images) Honduran migrants taking part in a caravan to the U.S., on Mexican soil after crossing the Suchiate River, Oct. 20, 2018. "We thought the caravan was passive but there were unruly people," Martinez, 37, told the Associated Press. "I was disappointed." He said he was attempting to escape violent gangs in Guatemala. "They killed some relatives; they shot my father and they also tried to kill me," Martinez told the AP. (Pedro Pardo/AFP/Getty Images) Honduran migrants heading in a caravan to the U.S., wait to help fellow men get down to the Suchiate River from the Guatemala-Mexico international border bridge, in Ciudad Hidalgo, Chiapas state, Mexico, Oct. 20, 2018. The Mexican Interior Ministry said on Saturday that 640 Honduran migrants have requested refuge in Mexico. The ministry also said that priority would be given to "164 women, some of them in advanced stage of pregnancy; 104 girls, boys and teenagers, who are from 3 months old to 17 years old; as well as older adults who have varying degrees of disability. This group includes a minor who traveled alone."